This year the very popular, annual gourmet festival “Europa’s Best” celebrates a truly special anniversary. For ten years, numerous Michelin-starred chefs and other high flyers in the world of haute cuisine, including wine growers, chocolatiers, patissiers and fromagers, have gathered together once a year on board Europa to transform the Lido Deck into a gourmet mile. To mark this anniversary in 2014, appropriately, Europa ’s chef de cuisine Thorsten Gillert will welcome on board ten top-prize chefs from Germany, Austria, Switzerland and, of course, Belgium. This year, as always, Europa will berth in Antwerp for its special evening event devoted entirely to the delights of haute cuisine par excellence. Also on board as special jubilee guest is Eckart Witzigmann, crowned “Chef of the Century” by Gault Millau. Passengers will also enjoy the pleasure of sampling one of his creations – a “signature dish” from his repertoire will be presented on the menu in the Europa Restaurant on the evening of the event. 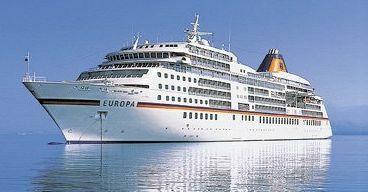 Gourmet Cruise Details: Europa departs on June 10, 2014, sailing for 14 days from Lisbon via Bilbao, St Jean de Luz, Bordeaux, Le Palais, St. Helier, St Peter Port, London (Greenwich),and Antwerp to Hamburg, from £4,440 per person. The Europa ’s Best Gourmet Festival will take place in Antwerp on June 22. For more information on the Europa Gourmet Cruise or any other Hapag-Lloyd cruise please call Gay Scruton at The Cruise people Ltd in London on 020 7723 2450 or e-mail cruise@cruisepeople.co.uk.